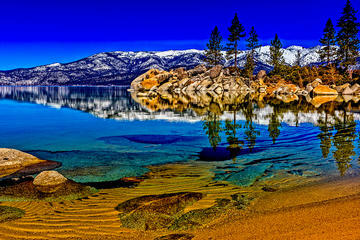 Lake Tahoe is a place of sublime beauty that inspires awe in even the most jaded of travelers. Mark Twain described it as "the fairest picture the whole earth affords." The picturesque setting mesmerizes visitors with its dazzling expanse of shimmering blue waters. The lake's brilliant topaz color is attributed to its depth of nearly 1,640 feet at the deepest point, and its crystal-clear quality comes from the purest source - melted snow supplied by 63 small streams. Lake Tahoe straddles the states of California and Nevada, spanning 22 miles from north to south and 12 miles across. It would require at least three hours to drive around the entire lake in good weather conditions. Sightseeing boat tours take about two hours to cruise around the lake, a peaceful way to admire the backdrop of pristine pine forests and snowcapped mountain peaks. Lake Tahoe is a year-round destination for nature lovers and outdoor adventure enthusiasts. During summertime, hiking, cycling, and water sports are popular. From December through April, Lake Tahoe is a winter wonderland with opportunities for alpine and cross-country skiing, sledding, snowshoeing, and sleigh riding. A small sheltered section on the west shore, the Emerald Bay State Park is one of the loveliest areas of Lake Tahoe. 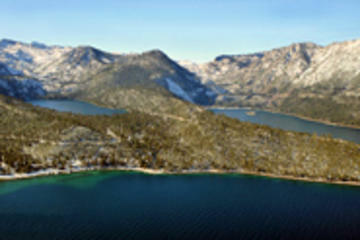 Emerald Bay is surrounded by forested hillsides of glacier-carved granite and dotted with a tiny islet at its center. Because the bay is slightly shallower than the rest of Lake Tahoe, the waters take on a striking blue-green color. Along the rugged shoreline of Emerald Bay are serene hiking trails with breathtaking panoramic vistas. Two favorite hikes are Cascade Falls Trail and Bayview Trail. Be sure to also visit Inspiration Point, 600 feet above Lake Tahoe, with paved pathways that offer amazing bird's-eye views of Emerald Bay. Hikers can also take the four-mile Rubicon Trail, a popular lakeside walking path that follows the water's edge from D.L. Bliss State Park to Emerald Bay. On the shores of Emerald Bay is a surprising landmark, Vikingsholm Castle, a marvelous example of 9th-century Scandinavian architecture. Visitors can take a tour of the 38-room castle, which is open to the public from late May until Labor Day. Emerald Bay State Park has two campsites: the Boat-In Camp, only accessible by boat or foot, and the Eagle Point Campground, which is walking distance to the lake and has a quiet secluded beach. During wintertime, Lake Tahoe is a popular destination for alpine skiing prized for its extensive terrain, sunshine, and powdery slopes. The area has several world-renowned ski resorts, including Squaw Valley, where the 1960 Winter Olympics were held and Heavenly, with 4,800 acres of gorgeous ski terrain with stunning views. Even those who don't ski will appreciate the Heavenly Gondola Ride, a glorious 2.4-mile scenic ride that stops at an Observation Deck at 9,123 feet and offers sweeping views of Lake Tahoe, Carson Valley, and the Desolation Wilderness. For those planning a day trip from San Francisco, the closest and most accessible resort is Sugar Bowl. Intermediate skiers love the runs at Northstar, while more advanced skiers prefer Kirkwood and Mount Rose for the challenging runs. In a beautiful forest location, the Tallac Historic Site includes three historic estates: Baldwin Estate, the Pope House, and the Valhalla Estate. During the summer, the entire site is open to visitors daily. Tourists can visit the Pope House to see how Tahoe's wealthy residents lived during the 1920s. Every year in August, the Pope House hosts a two-day Great Gatsby Festival that draws crowds for elegant Roaring Twenties social gatherings. The Valhalla Estate is a favorite local venue for private events and weddings. Every summer, the Art, Music & Theatre Festival takes place at the Valhalla Estate. The Baldwin Estate has been converted into a historical museum, an attraction that gives visitors a peek into life at Lake Tahoe in the past century. Exhibits include a 1930s-era kitchen, vintage children's games, and toys. Less than a mile away from the Tallac Historic Site is the Camp Richardson resort. This unique recreational site has a marina with a small beach and offers a variety of lodging options including a historic hotel, cabins by the lake, campsites, and RV sites. During summer, the resort is a great place for boating, hiking, and biking; during winter, cross-country skiing and sleigh rides are popular activities. Sheltered by a forest of Jeffrey Pine Trees, this large, sandy beach is an ideal place for sunbathing, swimming, and boating during summertime. Kings Beach is in the North Shore of Lake Tahoe and enjoys direct sunshine from the early morning until the late afternoon. Well-designed for visitors, the Kings Beach State Recreation Area has public restrooms, picnic tables in a shaded area, barbecue pits, a playground, and a half-size basketball court. Fishing is allowed but requires a license. The few blocks around Kings Beach are lined with many shops, restaurants, and street vendors. The Ed Z'berg Sugar Pine Point State Park extends along Lake Tahoe for nearly two miles, with densely wooded forests of aspen, fire pine, and juniper trees. The property was owned by the wealthy financier Isaias W. Hellman and later by his daughter, Florence Hellman Ehrman, from 1897 until 1965. The family's opulent vacation residence, the Hellman-Ehrman Mansion was completed in 1903. Designed as a summer home, the casual yet elegantly rustic mansion was equipped with the most modern conveniences of the time. The dining rooms feature redwood paneling and the guest rooms are decorated with Navajo rugs. The estate stands in a tranquil pine and cedar grove on 2,000 acres of woodlands. The grounds include a flower garden with a gazebo, which is often used as a wedding venue. The Hellman-Ehrman Mansion is open to the public for tours from late May until the end of September. Near the mansion is Nature Center with interesting exhibits about birds, lake ecology, wildflowers, trees, and other environmental topics. During summertime, visitors flock to the Ed Z'berg Sugar Pine Point State Park to go hiking around the park's extensive trails. Other popular warm-weather activities include swimming or sunbathing at the small lakeside beach. Fishing in the park's stream is allowed from mid-July to September. In the winter, cross-country skiers will enjoy exploring the park's 20 kilometers of marked trails. The park has campsites, picnic tables, and barbecue pits, and the facilities are available for use year-round. During wintertime, it is advised to check the weather conditions in advance. Duane L. Bliss was a lumber baron who made his fortune in banking, logging, and railroads during the late 19th century and early 20th century. In 1929, the Bliss family donated 744 acres of private property to the California State park system. Today, visitors can enjoy the beauty of this public park with its abundant hiking trails, picnic areas, and pleasant lakeside areas. On hot days, the sandy Lester Beach and Calawee Cove are the places to go. Swimmers enjoy the crystal-clear waters and sunbathers delight in basking under the warm summer rays. Both Lester Beach and Calawee Cove sites offer opportunities for water sports including kayaking, canoeing, and paddle-boarding. Visitors also come to D.L. Bliss State Park for the scenery, especially the Rubicon Point trail that offers sensational views of Lake Tahoe. Other favorite hikes are the Lighthouse Trail and the Balancing Rock Nature Trail. During summertime, D.L. Bliss State Park campground makes available 150 family campsites. In North Lake Tahoe on the Nevada side, the Sand Harbor State Park offers miles of sandy beaches as well as hidden coves and shady pine forests. The 55-acre park offers opportunities for swimming and scuba diving in the crystal-clear waters of Lake Tahoe. Lifeguards are on duty from Memorial Day through Labor Day. Sailing and boating enthusiasts appreciate the dock and Boat Launch Point as a place to begin boating adventures. Hikers enjoy exploring the park's vast wilderness. Noteworthy hikes are the Sand Point Nature Trail, a short hike with sweeping panoramic views of the lake, and the Sand Harbor to Memorial Point Trail, a half-mile trail with access to secluded beaches and rocky coves. Sand Harbor State Park also has shaded picnic areas under the fragrant Jeffrey pines. Other facilities include a visitor center, gift shop, and casual restaurant. Literary types should plan to attend the Lake Tahoe Shakespeare Festival during July or August. The festival presents a series of performances, highlighting some of Shakespeare's most famous works. Audiences will enjoy the entertaining performances in an exquisite outdoor theater, set amid a grove of towering pine trees. The sublime backdrop of Lake Tahoe and romantic starry night skies add to the special experience. The Eagle Rock Hiking Trail is a spectacular hiking trail on Lake Tahoe's west shore, just four miles away from Tahoe City. Eagle Rock is a dramatic volcanic outcrop, perched at an elevation of more than 6,000 feet, which is a few hundred feet above Lake Tahoe. This short easy hike is about a half-mile long and can be completed in 20 minutes, however it rewards with magnificent panoramic views. The Ritz-Carlton, Lake Tahoe: 5-star luxury, ski-in/ski-out Northstar California location, slope-side spa, children's program, lake club, cabana-lined pool. Deerfield Lodge at Heavenly: mid-range boutique hotel, contemporary rooms and apartment-style accommodation, gas fireplaces, Keurig coffee makers. 7 Seas Inn at Tahoe: 3-star boutique inn, walk to Heavenly Village and the lake, evening reception, complimentary breakfast, hot tub. Aston Lakeland Village Beach & Mountain Resort: budget-friendly lakefront hotel, outdoor pool, breakfast included, free parking.